One of GDS’s visions for GOV.UK is for all content to be grouped and organised based on what it’s about. Grouping content in this way should help users find content by subject area and help government organisations manage their content. To get there, we need publishers to tag content to a single sitewide topic taxonomy. We recently built a taxonomy tagging interface into the Whitehall publisher app and opened it up to all publishers across government. 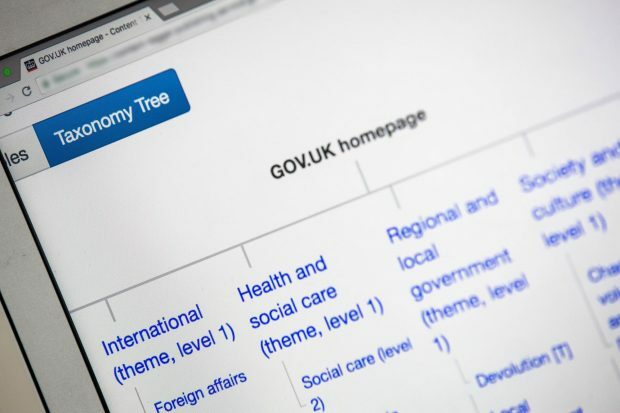 Publishers are presented with the full GOV.UK taxonomy and asked to tag their content to the topic or topics that best describe what the content is about. The taxonomy is not finished and never will be - it’ll always be evolving and improving. Publisher feedback is really valuable to us because publishers often know more about their content than anyone else. We need their input to help us iterate the taxonomy. Publishers can submit feedback about the topic taxonomy from within the tagging interface. They can suggest new topics or request changes to an existing topic, like its name or position in the taxonomy. For example, we renamed ‘Chemical hazards’ to ‘Chemical and environmental hazards’ because a publisher told us this topic’s scope was broader than we thought. Since we implemented the tagging interface we’ve received loads of really helpful feedback from publishers, most of which has already been acted on. Requests from publishers to make improvements to the taxonomy are now being triaged by our content support team. We know we need to make it easier for publishers to tag their content accurately. The tagging interface is pretty basic right now. We’ve got lots of data about how publishers are using it, both qualitative from user research labs and quantitative from Google Analytics and BigQuery. We've fed these insights into new designs for an improved interface, which will be picked up as part of a broader mission to improve the publishing workflow. Si is an Associate Product Manager on GOV.UK. You can follow Si on Twitter.